I’m alone now on the boat — Sabrina, Jonathan, and Gary left last week. We had lots of fun… but now it’s time to buckle up and get to work. I just received a call from Toni at the Apataki boatyard last night that we are “Go” for hauling out next week. Well, the wind is blowing from the opposite direction as normal, light NW, so there’s no time to lose. I raise anchor to begin a 24hr passage. I suppose it’s appropriate — I’ll be sailing east on my birthday. I’m turning 38 years old today. Going east on a solo overnight trip for 115nm isn’t really a birthday party, and probably not relaxing. On one hand I’d prefer to stay in Tikehau a few more days, and enjoy time with a remarkable group of young sailors who have collected there. But on the other hand, it is the right thing; since what I want to do most, is to give back to this boat Aldebaran, which has given us so much. So many boats were disabled on the crossing from Panama to French Polynesia: I just heard another story of a broken rudder, disabling the boat for two weeks at sea while the crew jury-rigged a rudder. That’s the 4th broken rudder story I heard. Then there’s the broken mast stories: 6 of them, including 2 big catamarans. A broken mast is pretty much the worse thing that can happen at sea, other than a big hole in your hull. None of the boats were even close to the age of Aldebaran. She just turned 50 years old this year. Happy birthday, Aldebaran! Aldebaran has been taking care of us. She’s been this amazing platform of exploration for over 120 friends, so far, who have experienced the wild freedom and heart-lifting beauty of sailing to remote islands. Still, her crew from the past 6 months can testify: she’s looking tired, in fact, battered, like she’s been in a long battle, and needs to lick her wounds. It’s time to give her some loving and bring her back to a state of respectability. It’s time to give back. We’ve received so much from this boat, that the Cup is no longer Half Full. The Cup is Overflowing and it’s been spilling for quite some time. There’s not much to do except offer deep appreciation for all the blessings that have unfolded. I’ll start by thanking the anonymous people in 1968 who built Aldebaran; cutting and nailing and screwing the wood, fiberglassing, and making this vessel a seaworthy work of art. It’s hard not to thank my parents Bob & Susie for giving me unconditional love to pursue my dreams. I had the great fortune of being able to share the joy of this experience with them this last December, as we sailed 5 islands and arrived in Bora-Bora in perfect blue skies for New Year’s Eve; which basically captured the pride of being a son into one iconic moment. I thank my brother Dylan, sister-in-law Christine, and sister Samara, who were also there, for their life-long fraternal proddings, which have made me slightly less soft than I would otherwise have become. Our family friend Hans was aboard, and I credit him with joining me in Papeete one week later to voluntarily repair our engine pump and transmission; demonstrating such a fervor and irrepressible drive in his quest to get the boat back to a sailing state, one could have been mistaken for thinking it was his first born child on the line. Also aboard our momentous Bora-Bora arrival (yes, there were a lot of people!) were Bear & Kati, who, between promoting Burning Man internationally and starting a socially responsible bank, are amazing people; but here I praise them for their role in the Green Coconut Run as Early Seabird investors. They were one of 30 different people who believed in us, saying “Heck, we’ll each give you about $1000 for the boat improvements, and hopefully we’ll see you in a few years in Tahiti.” And here we were. I thank all of you for your faith — you know who you are. There was one other person aboard Aldebaran that day, arriving in Bora-Bora with us. His name is Zuck. He’s a friend of Bear & Kati’s, an ex-Yahoo employee who after being disillusioned with tech, and through all kinds of irrational followings of the heart, has become a force in the world of refugee camps. I thank him not only for his unceasing enthusiasm for every moment of every day, but also for his fearless drive to do good in the world, amidst extremely challenging environments. 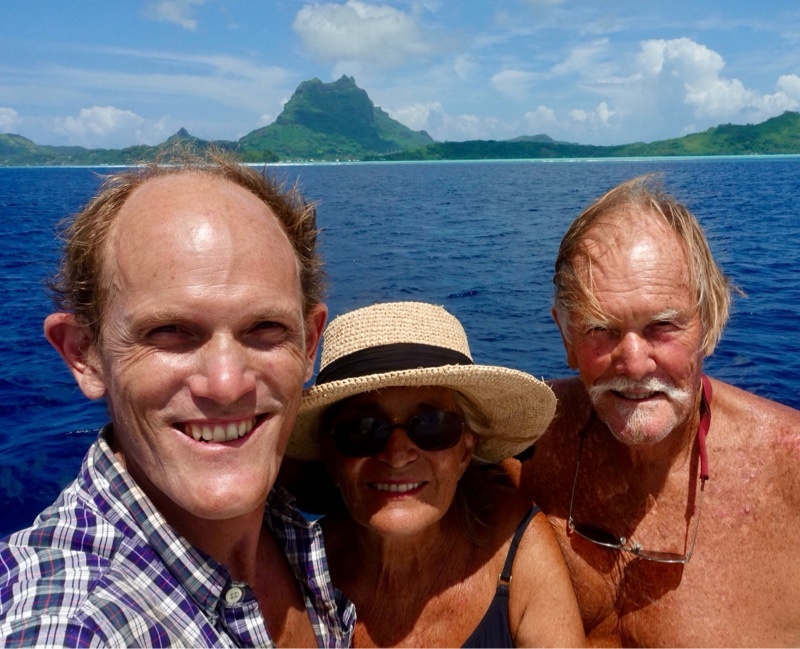 So that arrival in Bora-Bora symbolically captured most of my world in a nutshell: family, old friends, and new friends that we’ve made through this expedition; arriving together in a place of beauty. Well, I say “most” of my world, because, for one…. my sweetheart Sabrina wasn’t there. She was back in Sacramento, California working in a hospital’s intensive care unit for a 6 month contract taking care of patients in extremely ill health. Yep, that’s the kind of stoic woman she is… willingly taking care of the sickest of people, while her husband is sailing in freakin’ paradise. I appreciate her on every level imaginable, but most recently, when I was having a meltdown-day of stress (yep, happens to me too, even in Tikehau), she stopped me and gently asked, “Kristian, what are you grateful for?” And all my rationale about the day’s intractable problems evaporated under the enormity of this question. Sabrina is an incredible woman. Ohh…. I lied about something. On New Year’s Eve, Sabrina wasn’t actually working in the hospital — she was in a weeklong vacation in Puerto Vallarta with our friend Heidy sipping on wine in a marina. Thanks for getting her out there, Heidy, and saving my skin!!! I would have felt really bad otherwise, if I was sailing into tropical heaven while Sabrina was working on the 5th floor of the Cardiac ICU. That just wouldn’t do. Finally… thanks to YOU for reading all the way to the end of this rambling sailor’s soliloquy. Consider that your birthday present to me. If you insist on giving a real present, give it to boat. It’s time to give back. Yes! She’s gonna be sparkling again soon! Boatyard here we come. Send any gifts to the boat to: “Aldebaran’s 50th Birthday Make-over” Fund, in any form of currency via Venmo, PayPal, or courier Pidgeon, to greencoconutrun@gmail.com. Happy birthday Kristian, Marija’s birthday is April 3rd and Tyler, Yasha and Brooke’s kid turns 2 on April 2nd. We are thinking of you. Happy birthday to Marija and Tyler! There’s a lot of fiery Aries out there! Happy birthday to you from Anchorage where the end of March has brought such warmth that all the snow is melting fast. I intend to see you in Tahiti one day, my friend! Blessings to you and Boat as you take good care of each other in celebration of all your accomplishments together. Thanks Sophie! If you don’t watch out, we’ll come visit you first! Missing ya!